Yesterday, Ontario’s four most powerful political party leaders took the stage to discuss the need for increased democratic engagement among youth and minority groups at Ryerson University, in a forum moderated by Toronto Star’s Martin Regg Cohn. 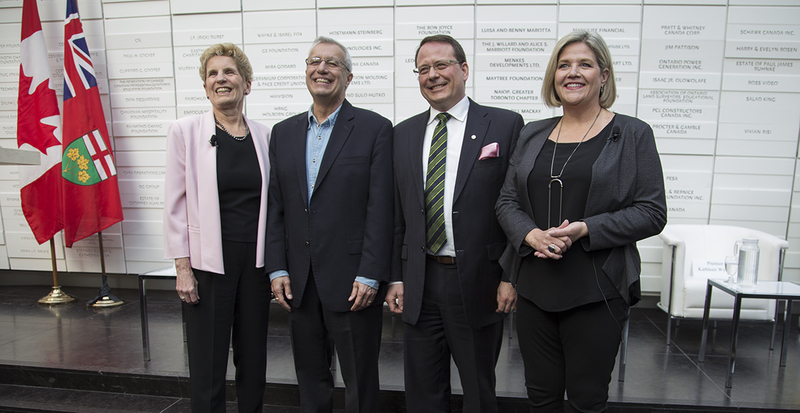 Mike Schreiner, leader of the Green Party of Ontario, joined Liberal Premier Kathleen Wynne, Progressive Conservative interim leader Vic Fedeli, and NDP Leader Andrea Horwath, to share ideas on how to better engage young people. To do this, Schreiner proposes solutions such as increased education from Elections Ontario on campuses on how and where to vote and reducing the voting age to 16 to build a lifelong habit of voting. Following the Leaders’ forum, Taylor Howarth, GPO Chair of Engagement and Outreach, joined a panel of political party strategists on how to further mobilize the youth to vote. “I think the question for young people in choosing who will form our next government, is ‘Are you investing in our future? What solutions does each party have going forward in invest in the youth’s future?’”, Howarth says.